Previous results have shown that in rats with non-ascitic cirrhosis there is an altered transport of sugars and amino acids associated with elongated microvilli. These alterations returned to normal with the administration of Insulin-Like Growth Factor-I (IGF-I). The aims of this study were to explore the evolution of these alterations and analyse the effect of IGF-I in rats with advanced cirrhosis and ascites. Thus, jejunal structure and nutrient transport (D-galactose, L-leucine, L-proline, L-glutamic acid and L-cystine) were studied in rats with ascitic cirrhosis. Advanced cirrhosis was induced by CCl4 inhalation and Phenobarbital administration for 30 weeks. Cirrhotic animals were divided into two groups which received IGF-I or saline during two weeks. Control group was studied in parallel. Jejunal microvilli were studied by electron microscopy. Nutrient transport was assessed in brush border membrane vesicles using 14C or 35S-labelled subtracts in the three experimental groups. Intestinal active Na+-dependent transport was significantly reduced in untreated cirrhotic rats. Kinetic studies showed a decreased Vmax and a reduced affinity for sugar and four amino acids transporters (expressed as an increased Kt) in the brush border membrane vesicles from untreated cirrhotic rats as compared with controls. Both parameters were normalised in the IGF-I-treated cirrhotic group. 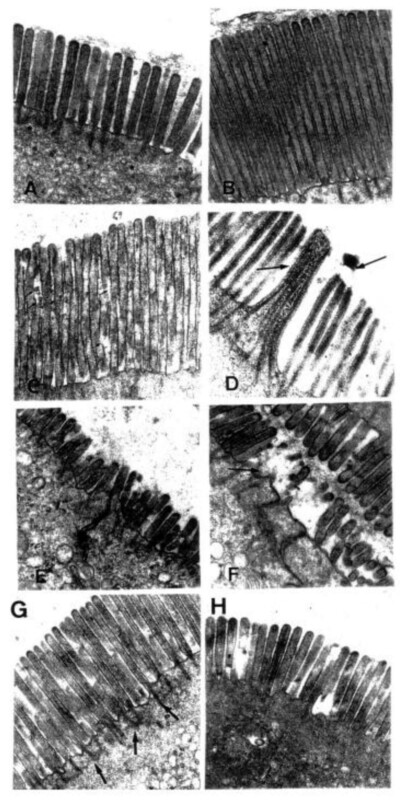 Electron microscopy showed elongation and fusion of microvilli with degenerative membrane lesions and/or notable atrophy. The initial microvilli elongation reported in non ascitic cirrhosis develops into atrophy in rats with advanced cirrhosis and nutrient transports (monosaccharides and amino acids) are progressively reduced. Both morphological and functional alterations improved significantly with low doses of IGF-I. Disordered energy, protein metabolism and malnutrition are complications of liver cirrhosis, especially in advanced stages [1, 2]. Although clinically significant malabsorption of nutrients is not frequent in these conditions, low-grade malabsorption seems to be involved in the development of malnutrition in these patients [1–3]. Plasma levels and/or bioavailability of Insulin-like Growth Factor-I (IGF-I), an anabolic peptide produced mainly in the liver, are diminished in cirrhotic patients [4–7]. Enterocytes express IGF-I receptor population [8–10]. Therefore, IGF-I levels might influence intestinal function. All gastrointestinal secretions have IGF-I-immunoreactivity . Therefore it was suggested that a deficiency of this hormone could be involved in maldigestion/ malabsorption, leading to malnutrition in cirrhosis [12–14]. In fact, recently published results have shown that in rats with non-ascitic cirrhosis there is an alteration of sugars and amino acid transport associated with elongation of microvilli [13, 15, 16]. Both morphological and functional alterations returned to normal with the administration of IGF-I, at low doses [13, 15, 16]. Taking into account these previous data, the purpose of this study was focused on elucidating the historical progression of these alterations by studying a series of animals with advanced cirrhosis and ascites. Therefore the specific aims of this study were: 1) to investigate the structure of jejunal microvilli and intestinal function in rats with ascitic liver cirrhosis; and 2) to study whether IGF-I could influence intestinal disturbances in advanced stages of the hepatic disease. For these purposes, the transport of galactose, L-leucine (neutral amino acid), L-proline (IMINO acid), L-glutamic acid (anionic or acidic amino acid) and L-cystine (sulfurate amino acid)- were investigated in brush border membrane vesicles (BBMV) in control rats, in untreated cirrhotic rats and in cirrhotic rats treated with IGF-I. In addition, electron microscopy (EM) of jejunal mucosa was performed in the three experimental groups. Liver cirrhosis was induced in male Wistar rats, as previously described [14, 18] by CCl4 inhalation and Phenobarbital in drinking water (Luminal®, Bayer, Leverkusen, Germany) (400 mg/L), for 11 weeks. Afterwards, cirrhotic rats continued receiving CCl4 once a week (2–3 min. inhalation) to complete 30 weeks of CCl4 administration. Age-matched healthy control rats (group CO, n = 10) were studied in parallel. In the last two weeks (28 to 30) cirrhotic animals received subcutaneous saline (untreated cirrhotic group, CI, n = 10) or IGF-I (2 μg × 100 g body weight-1 × day-1, group CI+IGF, n = 10) for two weeks. Control rats (CO) received saline during the last two weeks of the study. The day before starting treatment (day 0), blood was collected from the retroocular plexus of all rats with capillary tubes (70 mm, Marienfeld, Mergenheim, Germany). Serum samples were divided into aliquots, and stored at -20°C. At the end of the experimental period (day 15), blood was collected again and animals were killed by decapitation. Ascites was confirmed and measured by the direct observation of the abdominal cavity. Jejunal samples (20 cm approx.) were immediately frozen by immersion in liquid N2 and stored at -80°C, and the proximal segment was processed by electron microscopy study. The liver was also dissected out and samples were processed for histological examination. Samples from jejunum were examined by an electron microscope operating at 60 KV (EM10C/CR, Zeiss, Oberkochen, Germany). Two different observers (at magnification × 4,000 and 10,000) evaluated randomly ten fields from each animal and length of microvilli was recorded blindly on photomicrographs. The arithmetic mean of the two scores was taken as the final measurement. BBMVs were isolated using the magnesium precipitation method as previously described . The procedure was carried out at 0–4°C. The averted jejunum was placed in 2 mmol/l Tris-HCl (pH 7.4) containing 100 mmol/l mannitol, stirred for 3 min (Vibro-mixer, E-1, Sorvall), and the scraped jejunal mucosa was removed. The mucosal suspension was mixed with 10 mmol/l MgCl2 (final concentration), and centrifuged at 10,000 × g (15 min). The supernatants were centrifuged again at 26,000 × g (30 min). Pellets were resuspended in 10 mmol/l MgCl2 and centrifuged at 26,000 × g (30 min). The final pellets were resuspended in the desired volume of 300 mmol/l mannitol, 0.1 mmol/l MgSO4, 10 mmol/l Tris-HEPES buffer (pH 7.4) (load solution), so that a final protein concentration of 8–10 mg/ml was obtained. Isolated membranes were circled by using a N27 gauge needle. Sucrase (EC 3.2.1.48, enterocyte apical membrane marker) and sodium-potasium-ATPase (EC 3.6.1.3, enterocyte basolateral membrane marker) activities were determined in BBMV suspension . Compared with the entire initial mucosal homogenate the BBMV activities of sucrase and sodium-potasium-ATPase were eleven and twenty fold greater and smaller, respectively. The total protein content of BBMVs was determined using Bradford method . Vesicles were stored in liquid N2. Determination of nutrient uptake by BBMVs was carried out as previously described [15, 16]. Assessment of amino acid uptake was performed at 25°C following the rapid filtration technique described by Hopfer et al. with few modifications. BBMV suspension (5 μl) was added to the incubation medium (45 μl) containing 1 mmol/l of unlabeled amino acid, 25 μCi/ml of radiolabeled substrate (14C-U-L-leucine, 14C-U-L-proline, 14C-L-U-glutamic acid or 35S-L-cystine, Amersham, U.K.), 100 mmol/l NaSCN or KSCN, 100 mmol/l mannitol, 0.1 mmol/l MgSO4 and 10 mmol/l Hepes (pH 7.4). The time courses of amino acid uptake were measured under the following two different experimental conditions: a) under a sodium-gradient condition (NaSCN); and b) in the absence of sodium-gradient (KSCN). At time intervals (30 s, 60 s, 90 s, etc), adding 5 ml of ice-cold stop solution containing 150 mmol/l KSCN and 10 mmol/l Tris-Hepes (pH 7.4) ended the incubation. The suspension was immediately poured onto a pre-wetted Millipore filter which was washed three times with 3 ml of ice-cold stop solution, dissolved in 5 ml of scintillator Hisafe 3 (LKB Products, Bromma, Sweden) and assessed in a Counter Wallac 1409 (Pharmacia, Turku, Finland). Non-specific binding to the filter was previously measured and subtracted from the total uptake. Results were expressed as pmol of amino acid uptake per mg of protein. 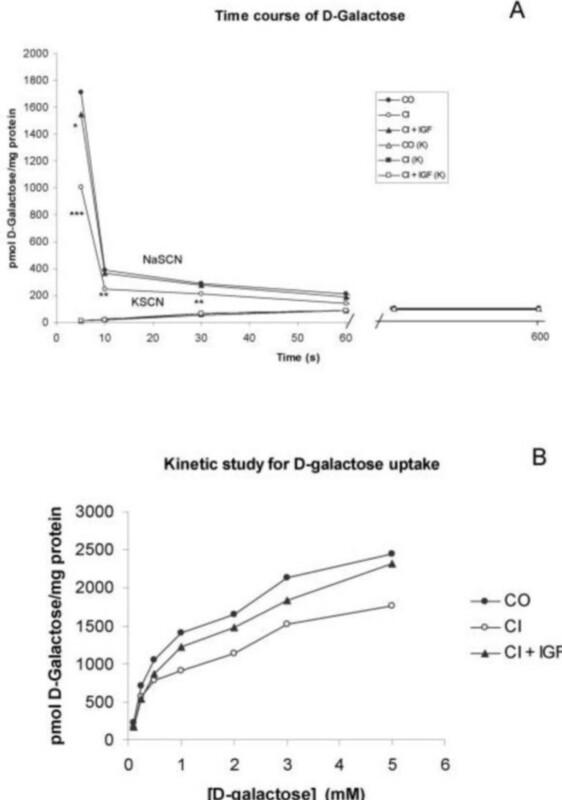 Kinetics of D-Galactose and amino acids uptake were evaluated as previously reported [15, 16] in the different aforementioned experimental conditions. Assays of uptake were carried out in the presence of several concentrations of substrate, from 0.025 until 7 mmol/l and at a fixed transport time of 3 seconds. Maximal velocity (Vmax) was expressed as pmol of substrate/mg protein in 3 seconds and the transporter affinity constant (Kt) was expressed as mmol/l. Data were expressed as mean ± SEM. To analyze the homogeneity among groups, Kruskall-Wallis test was used, followed by multiple post-hoc comparisons using Mann-Withney U tests with Bonferroni adjustment. Any p value <0.05 was considered to be statistically significant. Calculations were performed with SPSS program version 6.0 (SPSS Inc., Chicago, IL). The Sigma Plot Program (version 3.02 for PC) was used to process data of the kinetics of galactose and amino acids uptake by BBMVs. Histological examinations (day 15 of the experimental period) confirmed the presence of cirrhosis in all animals that had received CCl4 (CI and CI+IGF groups). All cirrhotic animals showed ascites (untreated cirrhotic animals, CI: 15.3 ± 2.4 ml, p < 0.001 vs control group; IGF-treated cirrhotic group, CI+IGF: 8.1 ± 1.3, p < 0.05 vs CI group) (Table 1). Figures 1A and 2 show uptakes of D-Galactose, L-leucine, L-proline, L-glutamic acid and L-cysteine by BBMVs. Galactose and amino acids uptakes were assessed in the presence or absence of sodium gradient. In absence of sodium gradient, there were no differences between the three experimental groups in all cases. In the presence of sodium gradient, untreated cirrhotic animals had a significant lower uptake as compared to controls, whereas BBMV from IGF-I-treated cirrhotic group presented normal values not significantly different compared to controls and significantly higher than those of BBMV from untreated cirrhotic rats. Uptake of D-Galactose into brush border membrane vesicles (BBMVs) (A) Time course of D-galactose. *p < 0.05, **p < 0.01, ***p < 0.001 CO vs othergroups. 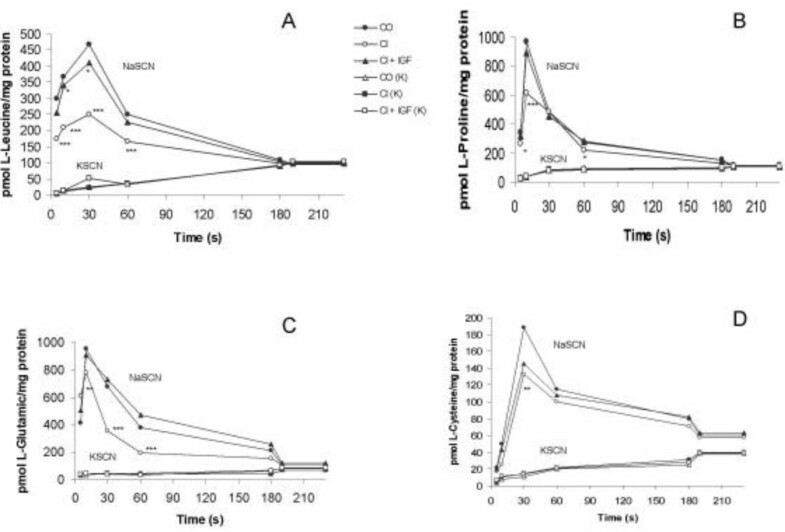 (B) Kinetic study of the Na+-dependent for D-galactose uptake into BBMVs. Each point represents the mean of initial rate of D-galactose transport (SE was <10%) obtained from three different experiments using a pool of BBMVs from 10 animals from each group. Kinetic studies of amino acid uptakes into brush border membrane vesicles (BBMVs) (A) Time course of L-leucine (1.0 mM) uptake by brush border membrane vesicles (BBMVs); (B) Time course of L-cysteine (1.0 mM) uptake; (C) Time course of L-glutamic acid (1.0 mM) uptake and (D) Time course of L-proline (1.0 mM) uptake with (in the presence of NaSCN) or without (in the presence of KSCN) sodium-gradient. *p < 0.05, **p < 0.01, ***p < 0.001 vs CO. No differences between groups were found in Na+-independent transport for the four amino acids studied. The kinetic studies of D-galactose and amino acid uptake by BBMVs were assessed at 3 seconds in the presence of different concentrations of substrates, from 0.01 to 5 mmol/l in a pool (n = 10 animals) of BBMVs from each group. It was found that Vmax was significantly diminished (p < 0.01) in untreated cirrhotic animals compared to CO group for sugar and for three of the four amino acids tested (Table 2). However, a significant recovery of this parameter was assessed in CI+IGF group reaching normal values in all cases. Values are mean ± SEM, n = pool of BBMVs from 10 animals from each group. Vmax expressed as pmol of substrate/ mg protein × 3 seconds and Kt as mmol/l. *p < 0.05, **p < 0.01, ***p < 0.001 CO vs other groups. On the other hand, untreated cirrhotic animals (CI) showed an increased Kt (p < 0.01) compared to controls, expressing a lower affinity of transporters for their substrates. This parameter improved in cirrhotic rats treated with IGF-I (Table 2). Electron microscopy studies are summarised in Figure 3 and Table 3. Ultrastructural alterations in microvilli varied from elongation to atrophy. Animals with compensated cirrhosis had elongated and straight microvilli (Fig. 3B) as has been previously reported [13, 15]. Elongated microvilli were also found in a 40% of ascitic cirrhotic rats (Fig. 3C). However in 30% of animals with ascitic cirrhosis, microvilli were shorter (Fig. 3E and 3F), irregular in shape, partly clustered and more loosely packed than normal. In the remaining rats enterocyte microvilli were longer and often fused (Fig. 3D), had electron lucent cores and their membrane was disrupted. Cirrhotic animals treated with IGF-I had a tendency to normalize the morphology of microvilli recovering normal size and electrondensity (Fig. 3G). No microvilli with atrophy were found in this group (CI+IGF) (Fig. 3H). Alterations of jejunal microvilli Electron microscopy of jejunal mucosa (× 10,000, magnification): (A) Microvilli from healthy controls; (B). Elongated microvilli described in animals with compensated cirrhosis [13,14]; (C). Elongated microvilli with degenerative lesions of membranes from ascitic cirrhotic rats (CI group); (D). Elongation and fusion of microvilli was found in 40% of untreated rats with ascitic cirrhosis (CI); (E) and (F) atrophy of microvilli was found in the remaining 60% of this group (CI). However, atrophy microvilli were not found in CI+IGF group (see (G) and (H)). Effect of IGF-I on microvilli in ascitic cirrhotic rats (CI+IGF group) (× 10,000, magnification): (G), area with mild elongated microvilli, and (H), quite normal epithelium instead of atrophy. Arrows show the increased density in actin microfilaments at the side of connection with the intermediate filaments network in microvilli from treated cirrhotic rats. Thus, the described alterations in untreated rats with ascitic cirrhosis (C, D, E and F) were partially improved by IGF-I treatment (G and H). Morphometric study of microvilli in animals with advanced liver cirrhosis. These results indicate the existence of an alteration in sugar and amino acid transport by the jejunum associated with atrophy of mucosa in rats with advanced cirrhosis. The main findings in this study were: 1) the evolution of jejunal structure from a marked elongation in early stages [13, 15] of liver cirrhosis to atrophy and degeneration of microvilli in advanced cirrhosis; 2) sugar and amino acid absorption were similar to that observed in the very early phase; and 3) the improvement of both morphological and functional alterations after a two week-course of treatment with low doses of IGF-I. Over many years, morphological studies in the small intestinal mucosa in patients with cirrhosis have been reported . Marked changes such as edema, inflammation and fibrosis of the villi have been described . In contrast, other studies found minimal changes or normal mucosa. Thus, histological reports of the small intestine in cirrhosis show wide variation . The present study shows the histological progression of microvilli overtime, suggesting that the presence of mucosa atrophy does occur in advanced cirrhosis with ascites. However, ultrastrutural changes are present since early stages of liver cirrhosis. Alterations of this nature may well contribute to malabsorption by altering carrier-substrate interaction, as it has been demonstrated [13, 15]. When cirrhosis is more advanced and rats show ascites, microvilli tend to become atrophied. In this stage, IGF-treatment was also able to restore normal intestinal morphology and function. In early stages of cirrhosis rats showed an elongation of microvilli . We proposed that this could explain the reduced intestinal transport of nutrients because of an altered position of the carriers in intestinal mucosa [13, 15, 16]. In more advanced cirrhosis the atrophy of the mucosa may in addition lead to a reduction in carrier number, explaining the reductions of maximal velocity (Vmax) and affinity of the transporters for their substrates (expressed as increased Kt) (Table 2). On the other hand, a question arises as to whether direct toxicity of CCl4 to intestinal mucosa could contribute to atrophy since alcohol is known to damage intestinal mucosa as well as liver and pancreas . In the present work CCl4 was given by inhalation, and thus its deleterious effects were exerted on liver [18, 22] and lung. In fact, this toxic possibility has been reasonably ruled out by the presence of similar levels of malondyaldehyde, a marker of lipid peroxidation , in intestinal mucosa homogenates from both controls and CCl4–treated rats (data not shown). According to previous studies [15, 16, 18], we postulate that the reported morphological and functional alterations in the jejunum could be due to IGF-I deficiency occurring in liver cirrhosis. In fact, we have previously shown that in this experimental model of advanced liver cirrhosis, serum levels of IGF-I were significantly reduced (35% of those found in healthy controls) . The first change on enterocytes, already described [13, 15], seems to be the reduction of density in actin microfilaments at the site of connection with the intermediate filaments network. The alterations of the electrondensity of microvilli are reported to be due to a rearrangement of cytoskeleton filaments . Interestingly, IGF-I induces marked changes in cell shape and cytoskeletal organization in different cell lines [13, 15, 25, 26]. The elongation of microvilli could occur as a secondary adaptive hyperplasia to increase the absorptive surface, thus enhancing the maximum absorptive capacities of the jejunum and ileum, as it has been described after treatment with prednisolone . It is well known that in coeliac syndromes a strict gluten-free diet produces a normalization of the mucosa in few weeks [28, 29]. In liver cirrhosis, portal hypertension could be a pathogenic factor for intestinal atrophy. In our experiment the effect of IGF-I on microvilli of cirrhotic rats may be explained in two ways that are not mutually exclusive themselves. On one hand, the amelioration of liver function induced by IGF-I  may have a secondary beneficial effect on intestinal morphology and function. On the other hand, a direct effect of IGF-I on microvilli is plausible since there is much evidence about the trophic effect of IGF-I on jejunum [30, 31] after small bowel resection and in parenterally fed rats [32, 33]. In conclusion, the relative early onset of intestinal damage, similar to mild lesion of coeliac disease could be due to different factors but the subsequent partial recovery is attributable to IGF-I administration. These results reinforce our previous observations of a beneficial effect of IGF-I on intestinal structure and function in rats with liver cirrhosis, acting not only in early but also in advanced stages of chronic hepatic disease. The authors wish to express their gratitude to Dr. Bruce Scharschmidt, Chiron Company (USA) for generously granting the IGF-I used in this study. We are also deeply indebted to Mrs Cristina Chocarro and Blanca Irigoyen for their expert technical assistance and the Grants from Mr. J. Celaya. Supported by the Spanish Program I+D, SAF 2001/1672. ICC: Experimental design and treatment (induction of liver cirrhosis and IGF-I administration), hypothesis, histopathological study and measurements (EM). MP: In vitro assays with BBMV and statistical analysis. EU: In vitro assays with BBMV and statistical analysis. JP: Histopathology diagnosis. JP: Experimental treatment and documentation. BV: Experimental treatment and documentation. ADC: Experimental treatment and documentation. MG: Analytical studies and experimental treatment. MDS: Analytical studies and measurements (EM). IVN: Biochemical analysis. AC: Hypothesis and experimental design. SGB: Design and Revision.